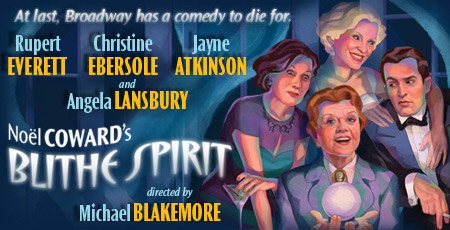 As low as $36.50 for Broadway's starry BLITHE SPIRIT! Wit, style and laughter aren't the only things being conjured up at the Shubert Theatre. This spring, Angela Lansbury, Rupert Everett, Christine Ebersole and Jayne Atkinson come to Broadway in Noël Coward's BLITHE SPIRIT, directed by Michael Blakemore. Also starring Simon Jones and Deborah Rush, it's the deliciously funny comedy about a successful novelist haunted by his biggest fan – his deceased first wife. $59.50 Orchestra/front mezzanine for Tuesday through Thursday performances. $69.50 Orchestra/front mezzanine for Friday, Saturday and Sunday performances. You don't need a crystal ball to see it's the best deal on Broadway! TO ORDER CALL 212-947-8844 and mention the code BSMU227 . VISIT BroadwayOffers.com and use the code BSMU227. Or BRING this offer to the Shubert Theatre box office, 225 West 44th Street.